A henge is a Neolithic earthwork. It has a ring bank and ditch, with the ditch inside the bank. They are not thought to be defensive. For defence, it would be much better to have the ditch outside the bank so attackers would need to climb up further. Henges are typical of the British Isles for example Stonehenge, but there are a few similar structures in continental Europe. The Great Circle at Stanton Drew in Somerset, which contains the second largest stone circle in Britain. The Ring of Brodgar in Orkney, which contains the third largest stone circle in Britain. Notes: example of henges without other significant internal monuments are the three henges of Thornborough Henges in Yorkshire. Stonehenge is not a typical henge because the ditch is outside the main earthwork bank. Mini henge (<20 m). Like an ordinary henge, except the central flat area is less than 20 m in diameter. An example is the Neolithic site at Dorchester on Thames. 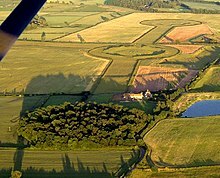 Henge enclosure (>300 m). A Neolithic ring earthwork with the ditch inside the bank, with the central flat area having abundant evidence of occupation and being more than 300 metres in diameter. Some true henges are as large as this (e.g., Avebury), but lack evidence of domestic occupation. Examples of henge enclosures are Durrington Walls in Wiltshire, and Mount Pleasant Henge in Dorset. This page was last changed on 8 February 2019, at 16:41.